Ships dock at the Tempozan Pier, in the center of Osaka's ever-developing waterfront. It is adjacent to a large mall and impressive Ferris wheel. A complete refurbishment of the port’s cruise terminal is scheduled for 2019. As the terminal undergoes construction, port officials plan to set up a temporary terminal on the pier. With a population of over five million people, Osaka is Japan's second largest city. For centuries, Osaka was Japan's cultural and commercial gateway to Asia -- the point of entry not only for trade goods, but most importantly, cultural influences that shaped Japan. Today, Osaka is a vibrant cultural center known for its shopping and exquisite cuisine. Osaka has a convenient subway system (easily navigable by non-Japanese speakers), and there's a stop at Tempozan Harbor Village. A taxi from the pier to the Sony Building in Shinsaibashi, a central area of downtown for shopping and dining, costs 3,000 yen (about $30). Universal Studios Japan is a 10-minute ride from the port. Osaka's most famous shopping district is Shinsaibashi, which offers a mix of huge department stores, high-end Western designer stores, and independent boutiques ranging from very cheap to very expensive. 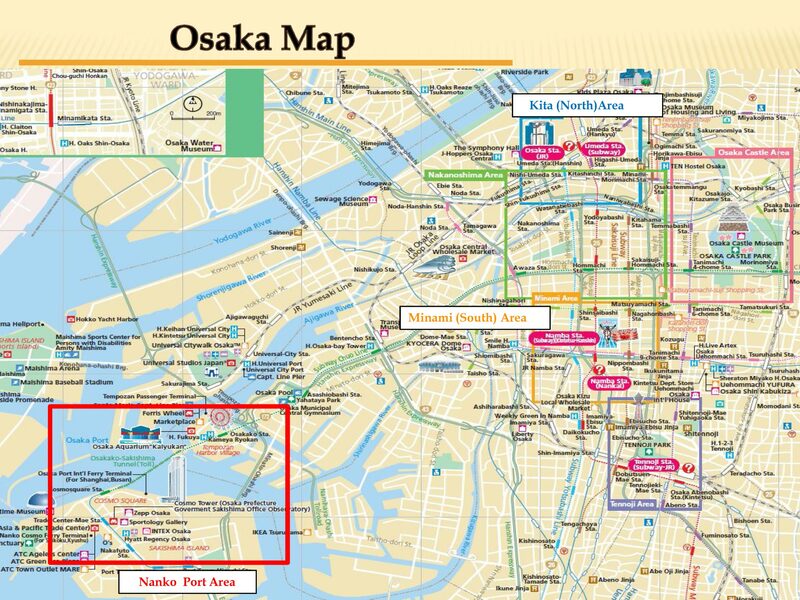 Osaka Free Wi-Fi is available at stations and major locations. Osaka Free Wi-Fi Lite is available at individual stores.